Gerald O’Grady’s first career was as a medievalist. 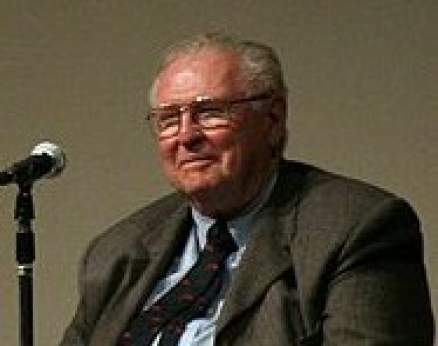 After studying for a Ph.D. at the University of Wisconsin (1954-58), he was a Marshall Scholar at St. Antony’s College, Oxford University, for the next three years, working with C. S. Lewis, J. R. R. Tolkien, and Beryl Smalley. He had a huge impact on culture in Buffalo and the world. He was a thought leader, it turned out, along with colleagues John McHale and Marshall McLuhan [he was hugely influenced by Marshall McLuhan]. The plowshare of his medievalist studies became the camera of a new media for the late twentieth century. 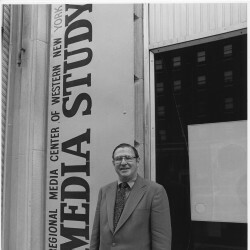 Before moving in 1967 to the State University of New York at Buffalo, he established a Media Center in Houston, Texas under the auspices of John and Dominique de Menil, reflecting his interest in the coming impact of technology on education (McLuhan) and his interest its reform. At that time, in film, there existed only graduate programs in production at NYU, UCLA and USC, and he began to explore curricula for the establishment of historical, interpretive and cultural studies in the field of media. He visited over 100 campuses to observe beginning courses and programs in film or cinema study and, to better understand existing institutional structures, taught seven courses at five different universities each week for the next three years, traveling more than 5000 miles each week between Buffalo, Austin, Texas (Department of Radio/Film/Television), Houston and New York City (Columbia University School of the Arts; New York University Department of Cinema Studies, and New School of Social Research Center for Understanding Media). I had the pleasure and the gift of working with and knowing Gerry well during my time at Buffalo from 1970 to 1985. Quite simply, he was — for his colleagues, for artists, and for the community in general — the most generous person I have ever had the privilege of working with. He will be much missed. I wish I had had a chance to meet him. He was visiting at York University In Toronto for awhile some years ago, but I never got there while he was still there.